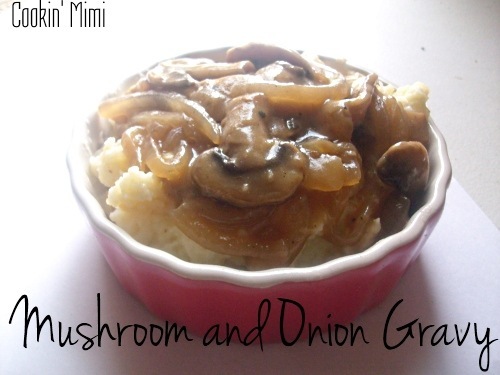 This mushroom and onion gravy is a good basic recipe. You can serve it with pot roasts, meatballs, and in shepherd’s pie as well. This is a pretty easy recipe to make and I’ll be showing some more uses in the coming weeks. Once you have the basic technique mastered you can make all kinds of gravy and I’ll be sharing how to make chicken or turkey gravy a little bit closer to Thanksgiving. in a medium skillet melt 2 Tablespoons of the butter over medium heat. Sauté the mushrooms, onion, and garlic with a pinch of salt until tender and fragrant. Remove from heat. In a sauce pan melt the remaining 2 Tablespoons of butter. Whisk in the flour and cook for 2 or 3 minutes so that the raw flour taste is gone. Whisk in the beef broth. Bring to a boil and let simmer for about 5 minutes or until the gravy coats the back of a spoon. Stir in the mushrooms and onions.